On Saturday I saw that the new Starbucks at Trianglen had opened and I resisted to urge to shout ‘shame on you’ to the people going inside when there are a number of great individual coffee shops in the area, most notably Original Coffee and where you don’t have your day’s worth of calories in one ‘drink’. There are also a number of older businesses closing on Østerbrogade and moving to other streets in the area including the amazing florist, Pernille Thiele Blomster and a lighting shop – the cost of rents being the reason at least for the florist and I imagine the lighting shop. I fear that gradually Østerbrogade is going to become homogenised and all the individual shops that bring variation to the street will vanish. Already this street is one of the least inspiring ones in the city when it comes to different shops with too many supermarkets and overpriced clothing boutiques. My son has been building a Lego village for some years, some buildings are official sets and others are custom builds. He favours Lego Friends sets are they are more often shops and buildings. From very early on he built two small owner run custom build shops – a fruit shop and a bakery. They have withstood a number of modifications to the village until the arrival a few weeks ago of a swish new Friends Lego supermarket run by a slightly smug young man called Daniel. The next day I was informed that the fruit shop would now be supplying the supermarket and the female mini figure who runs it will turn it into a house. The bakery is under discussions to become an annexe, although self run by the bakers, to the supermarket. This is all from my son’s imagination but sadly is very reflective of the times we live in. I spent some time back in my old neighbourhood in Frederiksberg this week and I was reminded of how much I love this part of town and it was lovely to go into a lot of my favourite shops but also to see some other new places opening. 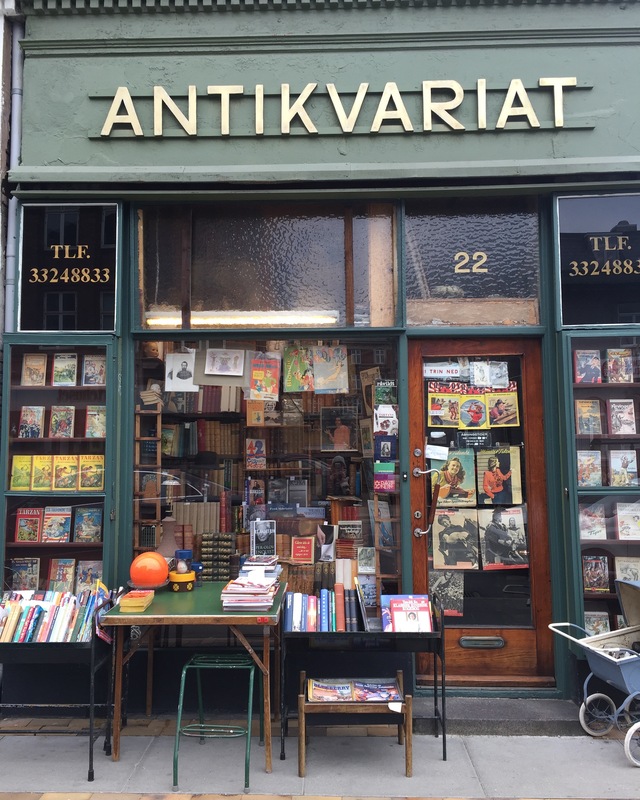 It helps that Gammel Kongevej has a strong business association, affluent residents and it is a street that many people walk down but the shops there, like the ones on the other streets mentioned below, take the time to make themselves appealing. I was speaking to the owner of a fabulous new clothes shop for tweens and whilst many shops feel the pressure to have a web shop as soon as they can, she feels that establishing the bricks and mortar shop first where people can see and touch things, she can make real contact with the customer and a real life experience is more important to her in establishing a successful business. It’s more about slow fashion and choosing wisely than rabid consumerism encouraged by shopping malls and chains. The plethora of individual shops and coffee shops has always been something that has delighted me about living in Copenhagen and I can still see this on Gammel Kongevej, Værnedamsvej, Jægersborggade and Istedgade particularly and the only way to keep these businesses in business is to shop in them otherwise our ‘high streets’ here will follow the pattern of the UK and the US. As someone who likes having a mix of both high-street choices and one-of-a-kind establishments, I feel compelled to comment here. Why would you assume that people who frequent Starbucks don’t visit other cafes in Østerbro, Melanie? I may visit a Starbucks but I also love Original Coffee, not to mention Kagestuen…another favourite. By all means, avoid Starbucks, support small establishments…that’s your choice. But shaming people for choosing to visit a certain coffee shop or for having a certain amount of calories…that’s not done. P.S: Lego’s a high-street toy brand with a chain of shops all over the world. Just saying. I do stick by my belief that the opening of chains like Starbucks in Copenhagen is a negative trend and that their drinks do not represent decent coffee. It’s also a wider issue of the ethics of large multi national companies and what they represent and the impacts they have (and intend to have) on local economies. I’d like to think that people go to a mix of shops but having worked on campaigns to save high streets in the UK it shows that the impact of lots of chains leads to the closure of smaller independents and then to choice is lost, the only way to preserve choice is to support it. I hate the homogenisation of cities via US style chains and malls. I try to avoid them as much as possible and support small cafes and independent shops. Sadly it seems a global trend that city centres become too expensive for them and only the biggest corporations or franchises can afford the rents. I think every big city should have a policy and committment to diversity and resist this process. We don’t need more bland McStarbucks sucking the character out of our city.